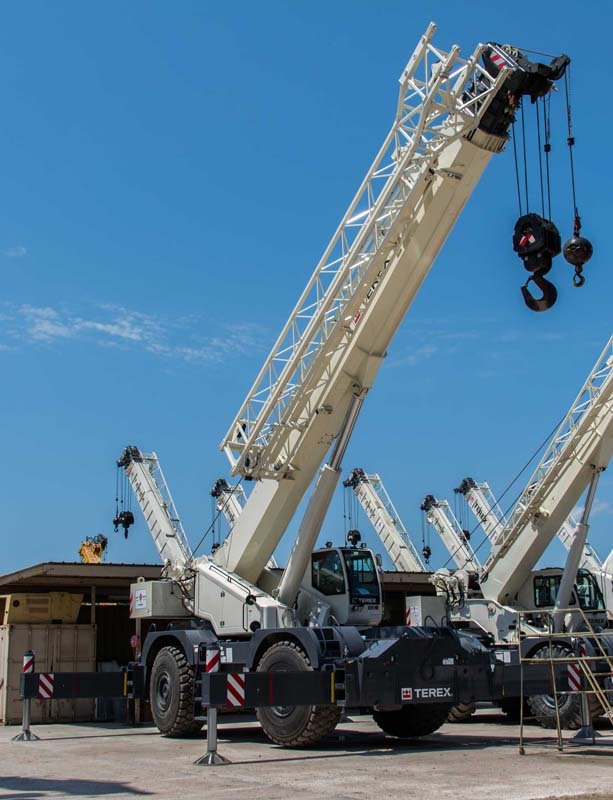 Terex Cranes have the reputation for being competent, durable workhorses that do not let you down. Their many operator-friendly features make them favorites at the worksite, as well. Rough terrain brings special challenges that require toughness and maneuverability. The Terex Quadstar 1100 is the finest of rough terrain cranes, with proven maneuverability and ground clearance suitable for the most rugged conditions. The Quadstar 1100 combines durability and flexibility with low ownership cost. All features are built for operation in rugged terrain and conditions. Typical operating functions for the Quadstar 1100 are bridge building, large-scale construction, and refinery or other plant projects. But this crane will go anywhere that it is needed. The specifications tell much of the story. The Terex Quadstar 1100 offers a 110-ton US capacity at 10 feet, and 155-foot maximum main boom length, with 72-foot maximum jib length. The boom itself is a 5-section full power boom, with dual mode boom extension. Featured also is a 3 pump, flow-sharing hydraulic system. The base vehicle weight is 105,000 lbs. The cab is accessed by way of non-slip steps, with a non-slip deck as well. The Quadstar is equipped with 3 positions, H-shape outriggers. Quadstar 1100 is powered by the excellent Cummins QSB6.7 six-cylinder engine, turbocharged and intercooled, rated at 260 horsepower. The diesel fuel tank has an 80-gallon capacity. The transmission is a 6 x 6 power-shift with selectable four-wheel drive. An 18-degree tiltable cab comes standard, with six-way adjustable operator's seat. Cab features include armrest mounted, dual axis electro-proportional joy sticks, and an intuitive graphic interface for the rated capacity indicator, multiple mirrors for good vision, sliding windows with tinted glass, and a roof skylight with wiper. Foot controls operate the throttle, and service and swing brakes. Power steering is three mode hydraulic. Standard equipment also includes an air conditioning and heating system, with flameless heat. Optional features available are: work light package, for the base of the boom and superstructure, revolving amber light, yellow strobe light, tire inflation kit, additional mirror for viewing hoist, battery disconnect switch, and front and/or rear pintle hook. In short, the Terex Quadstar 1100 comes ruggedly built, from top to bottom, to get your rough terrain jobs done. Scott-Macon Equipment has served the heavy lifting equipment industry for more than 40 years. We handle sales, rentals, and service for the Terex cranes. We can help you determine whether purchase or rental of the Terex Quadstar 1100 crane is most practical for your particular business. Founded in 1973, we have service centers throughout Texas, Louisiana, and Oklahoma. 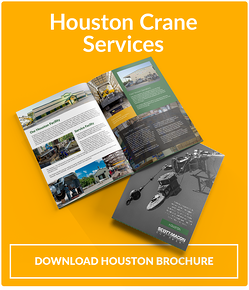 Our rental fleet of cranes is one of the largest in North America, and our reputation has been built on the solid foundation of sales, rental, and service support.We sell, rent, and service heavy lifting equipment of all types, for any need.